For the last 9 years Jenny has been dedicating some of her time into bringing women of all walks of life together. Sharing her love and passion for dancing, whilst building technical and performance skills and most importantly improving their confidence level. The Sophisticated Ladies is an All Girl Authentic Jazz Dance Company based in London. Directed and Choreographed by Jenny for the last 9 years, they have been wooing audiences, bringing class, fun and sophistication wherever they perform. Recently seen on The Peoples Strictly for Comic Relief, revealing Robin Windsor to his partner. We have a variety of routines designed to fit almost any occasion. It is also possible to adjust routines according to how many ladies are available or the size of venue. 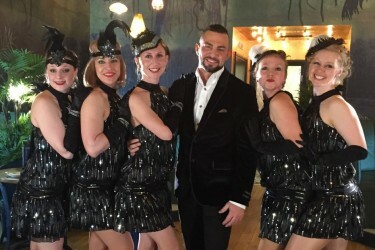 Specialising in 1920’s Charleston, 1930’s – 40’s Swing, 1960’s Vernacular Jazz, Fosse Style and GoGo. Ideal for private parties, corporate events, festivals and theatre. We can also offer a fun short dance class to warm up your guests before the ladies perform for you, a great way of getting your party started. Formerly know as The Hepcat Chorus. A Vintage Chorus Line Dance Group based in Bristol, UK. With Jennys mentoring and choreography The Bristolettes having been managed by Sophie Sheldrake since they began in September 2014. Already having performed at Camp Savoy and other International Dance Events, the girls are creating an exciting and energetic energy on and off the dance floor.